---Alarm sirens blared across the compound. Shas'O Sha'is'Nen proceeded with his retinue through the trenches and between bunkers, approaching his goal. He could now see the mysterious contraption nestled in the center of the trench network. Across the compound bulky figures appeared: Gue'la "Space Marines." They had apparently been expecting his cadre's move to steal the xeno-tech while the garrison was called away to deal with his own feint maneuver. Their hulking appearance was always something of a surprise when considering they possessed a modest intelligence. "Vre'Mon'yan, occupy the Gue but be mindful of your situation. Leave the battlefield when your limit is reached. 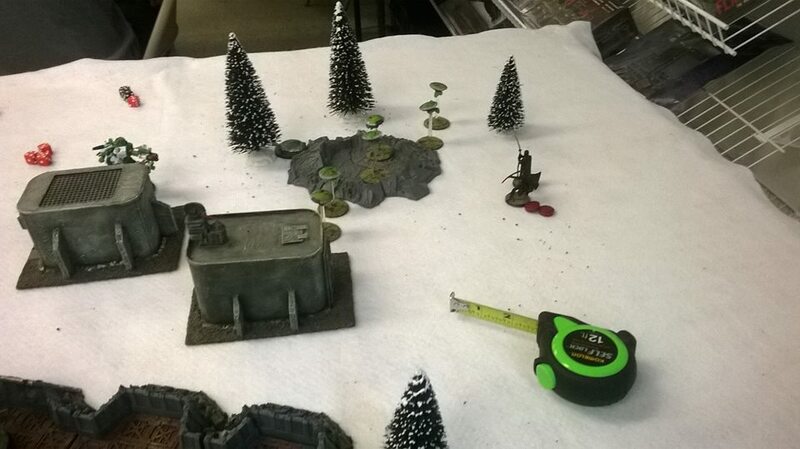 This is the battle report for Round 2 of our local tournament: "The Quickening." 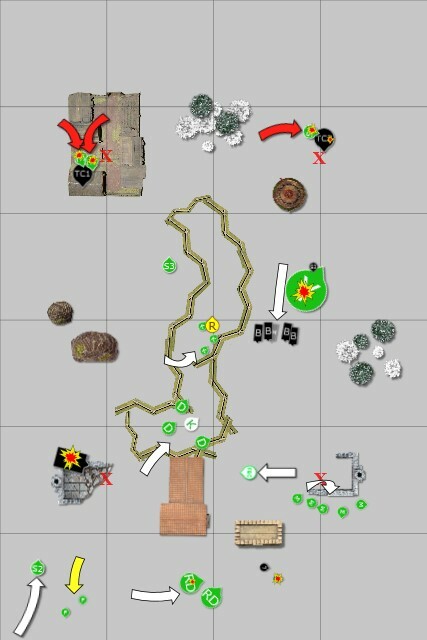 This match was against a rough combination of Space Marine net list components. I had seen the list beforehand and I knew this one was going to be tough. The list was originally intended to have 4 centurions but he didn't get the 4th bought in time. 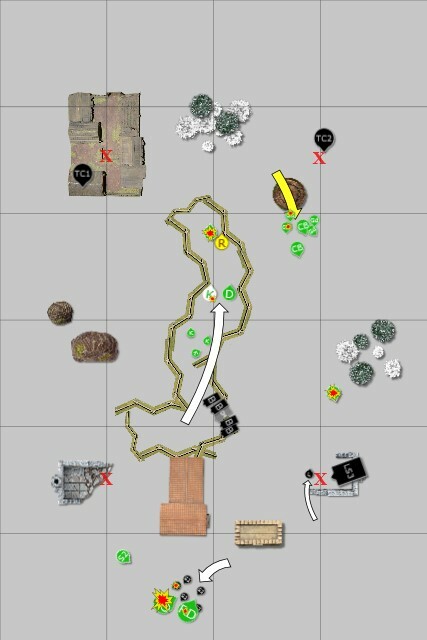 It was a simple list to play with tough backfield components, two heavy hitting sledgehammers that could move, and a multitude of annoying Obsec units for capping objectives. Mission: modified NOVA mission. 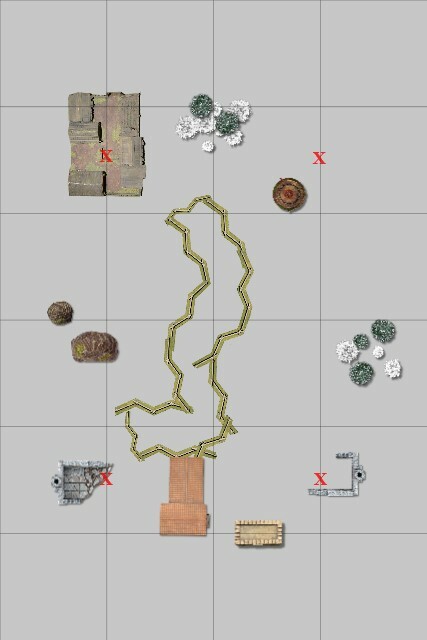 4 objectives, one in each table quarter and a Relic in the center. He chose the "score as you go" option and I chose the "score at game's end" option. .
We also secretly selected our secondary objectives. I chose 1st Blood, Linebreaker, and marked one of his Land Speeder Storms for death. He chose Linebreaker, marked my Riptide for death, and Slay the Warlord. Each secondary was worth 2 points. Warlord Traits: My warlord was the Cityfighter from the Strategic Traits, and his Chapter Master got something that I don't remember mattering. Psychic Powers: He got everything he could ever wish for. He got Invisibility, Gate of Infinity, Vortex of Doom, and a couple other powers that I don't remember. 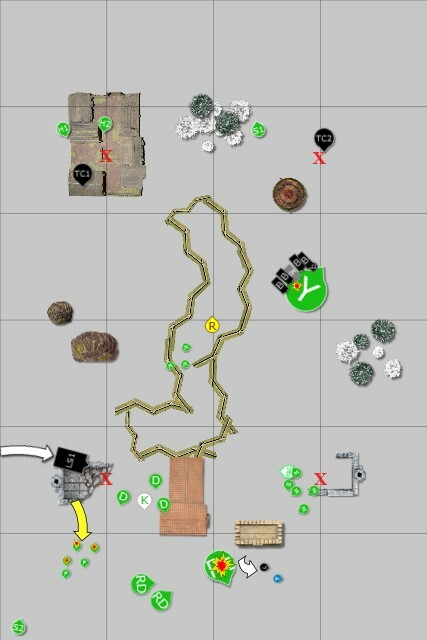 I won the roll-off, but in hindsight I really did choose the wrong side. I gave him the side that had fewer terrain pieces but those pieces were much better at blocking line of sight and were perfect hiding places for his Centurions and Thunderfire Cannons. He put the Vengeance Weapons Battery (VWB) next to one objective as an extra LOS blocker for his Thunderfire Cannon. I put my Riptide and Deathrains in the center on the front line. The firewarriors on one objective and my marker unit on the other. The Y'vahra I put a little ways back. He put a Thunderfire Cannon on each objective, out of sight. The Centurions+Librarians also deployed out of sight in the larger building. His bike unit deployed front and center. 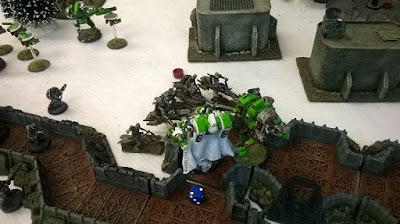 I won the roll-off for infiltrators and put my Kroot as near the Relic as possible. He put two squads of scouts on either side of the board, as close as they could to my units. Mercifully, he failed to seize the initiative. I nova-charged the Riptide and Y'vahra's shields, anticipating devastating Grav firepower. I moved up my Deathrains, markers, Kroot, and Riptide. I decided to use the Y'vahra as an early distraction and moved him the full 24" as close to the enemy scouts as I could. I used the marker drones, Kroot, and Deathrains to wipe out one Scout Squad, getting 1st Blood. My Riptide, dropped a large Ion blast on the bikes, but (as expected) caused no wounds. The Y'vahra used its flamer to just barely catch one scout and the Chapter Master under the template. Two scouts were roasted and the Chapter Master lost a wound. The scouts' morale held. I jumped my Riptide back a bit, shielding the Deathrains from the coming Grav in my backfield. The Y'vahra jumped right into combat with the Scouts. The scouts caused no wounds and the Y'vahra failed to kill any as well. He moved his bikes into position and had nothing else to move. He cast Gate of Infinity on his centurion unit, but failed to cast Invisibility (periled as well). They landed smack on target behind my lines. His Thunderfire Cannons targeted my Firewarriors and Kroot. I lost 7 Kroot and 1 Firewarrior. The Kroot passed their morale check. The Centurions split their fire between the Riptide and the Marker Drone unit. He killed a drone and wounded my Warlord twice. The Riptide took 3 wounds from the other Grav cannons. My two Heatwaves, two Sunforges, and my Remoras arrived from reserve. One of the Sunforges had a mishap and was placed way back in my own table corner. The other suits landed in his backfield while my Remoras came on ready to shoot up the Centurions in my own backfield. My Riptide Nova charged it's secondary weapon to fire twice, the Y'vahra Nova charged its shield. I could have escaped combat but I decided it would be better to hold him up to give me time to deal with the Centurionstar. The Vengeance Weapons Battery stripped a hull point and stunned one of my Remoras. The sunforge that landed on target killed the VWB with a single shot, causing a total collapse. The heatwaves had both landed too far away to hit anything. 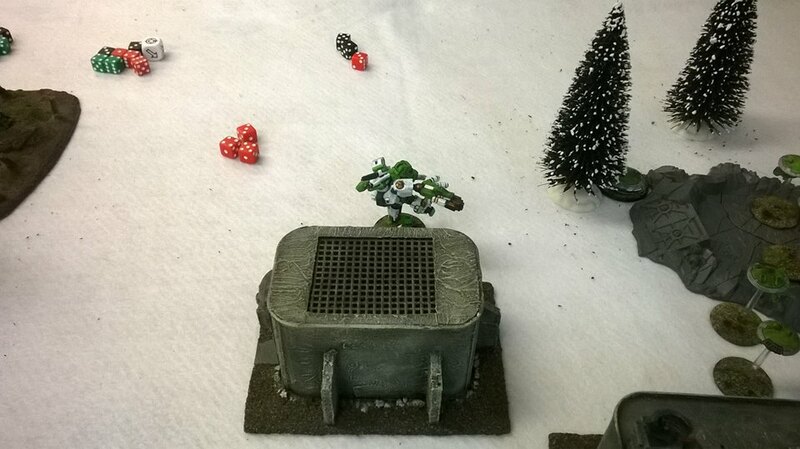 The marker drones lit up the Centurionstar, landing a good few hits, which my Riptide promptly used to nuke the unit. He killed off two Centurions and wounded the level 2 psyker. My Deathrains and Remoras finished off the last Centurion and wounded Tigerius and the other Librarian. Both psykers were now on their last wound. The Y'vahra squashed the last scout in combat, and took another wound. My other suits all jumped closer to their targets (I forgot to move the Sunforge in the corner) and onto objectives. I charged my Riptide straight into combat with the two psykers. He failed to finish off either of the psykers, and took no wounds in return. Two of his Land Speeder Storms arrived from Reserves, but the one that he had chosen to Deep Strike (the one I'd marked for death and was carrying his other scouts) had a mishap and went back into Reserves. The speeder that Outflanked came straight onto one of my home objectives, contesting it. He had nothing worth moving. He cast Force for his two psykers but I was able to deny Invisibility this turn with a lucky pair of 6's! In addition, he periled and Tigerius forgot Vortex of Doom. The Thunderfire Cannons shot at my Firewarriors, one missing badly and the other only killing one. The newly arrived speeder fired at them too and had better luck, killing two. 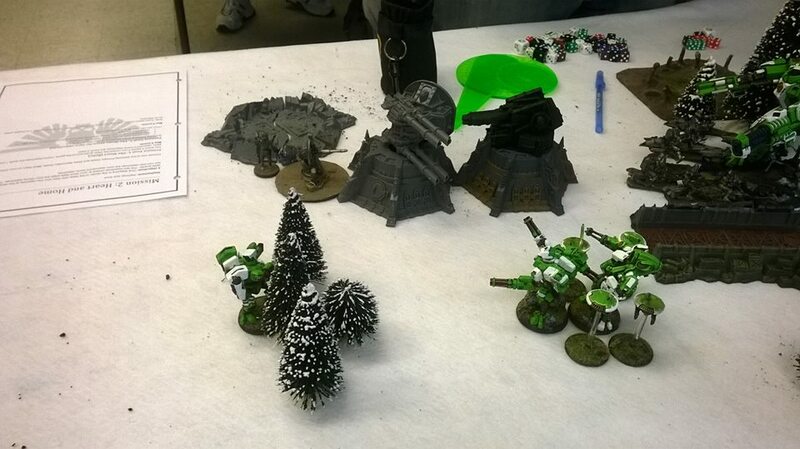 The Fire Warriors failed their morale check and fell back, giving up that objective to the Land Speeder Storm. In close combat, the Psykers killed off the Riptide with a single Instant Death wound. The Y'vahra inflicted no wounds and took a single wound in return (now on its last wound). 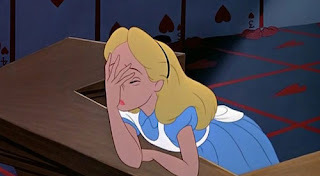 I passed my leadership check then I tested for Hit-And-Run but failed the initiative test. One of my Sunforges arrived from reserve, but the Cloudbursts and other Sunforge did not. I put him on the Relic but he scattered wide. I chose not to try to Nova Charge my Y'vahra, in order to avoid him dying to the Nova wound. 4+ invulnerable was still good so if I was lucky I would take no wounds again. My Fire Warriors rallied but were too far away to contest or shoot much.My warlord moved away from the marker drones, I was hoping to get him to my Deathrain team so that when I got caught in combat with some people I could challenge his Chapter Master with my Shas'O'Mortal and allow my FBC free reign to kill the rest of the squad (this was actually an error, since two of the marker drones should have come with him, but I forgot they weren't all one unit).The marker drones moved to block the psykers from the objective they were approaching. I dropped the Remoras into skimmer mode in order to keep the Librarians in their firing arc. The new Sunforge didn't have range on anything this turn. The marker drones landed a couple hits. The Remoras used the hits to shoot up the Librarians, but only killed Tigerius. The Deathrains fired at the Land Speeder, killing it easily. The Sunforge nearest his objective fired and wounded the Thunderfire Cannon. The two Heatwaves failed to wound the other. I forgot to fire at the librarian with my FBC. This shows that my Cloudbursts actually came in this turn, but I know for a fact they did nothing. I apologize for the confusion. The Y'vahra finally got killed in close combat. The Heatwaves and Sunforge both charged the Techmarines (what was I thinking?) and were all promptly killed by their power fists. I hopped my lone Sunforge onto the objective next to the wrecked Land Speeder Storm. The Sunforge in the enemy deployment zone used its thrust move to get onto the relic. Things had swung his way over the last turn, and almost entirely due to my own mistakes. His other reserves also arrived, making my situation pretty dire. One speeder came on to cap the objective my Marker Drones were screening, and the one that was Deep Striking landed near my Remoras. The Scouts hopped out of the Deep Striking Land Speeder Storm. The librarian regained one of his wounds (It Will Not Die from Iron Hands chapter tactics) and moved toward my Marker Drones. The chapter master and his unit sped around my Kroot and went straight for my Deathrain unit. The speeders themselves didn't actually kill anything this turn. The Thunderfire Cannons targeted my Sunforge but couldn't wound it. One of them scattered very wide, hitting my poor Fire Warriors, killing one and forcing the last member to flee off the table. 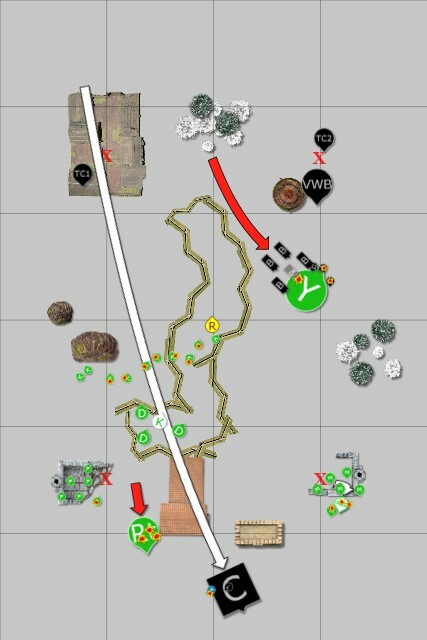 The Scouts targeted my FBC, killing him with some poor rolling on my part. The Chapter Master dropped the Orbital Bombardment on my Deathrains, killing two of them, but my Shas'O passed his invulnerable save (thank goodness!). The bikes' other weapons had no effect on my Shas'O. The Librarian charged my drones, killing and sweeping them with ease. The bike unit charged my Shas'O. My Shas'O took two wounds, but passed everything else. He opted for the S10 AP1 single attack but missed and lost the combat. He passed his leadership check though. Foolish Shas'O. You should have known you would fail your first 4 saving throws! The last of my reserves finally arrived. 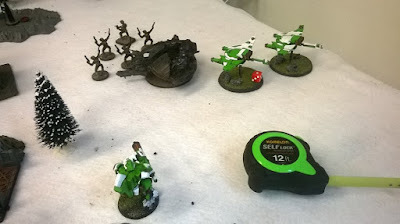 I dropped one Sunforge near the speeder capping my objective, scattering a fair bit due to the jammer on the speeder. The Cloudbursts landed in his backfield. I moved the Sunforge with the Relic a bit deeper into enemy territory. My Sunforge turned away from capping an Objective to help kill the Deep Striking Speeder. The new Sunforge failed to get any hits past the speeder's jink save. My Remoras and other Sunforge had better luck, exploding the Speeder that had landed near them. 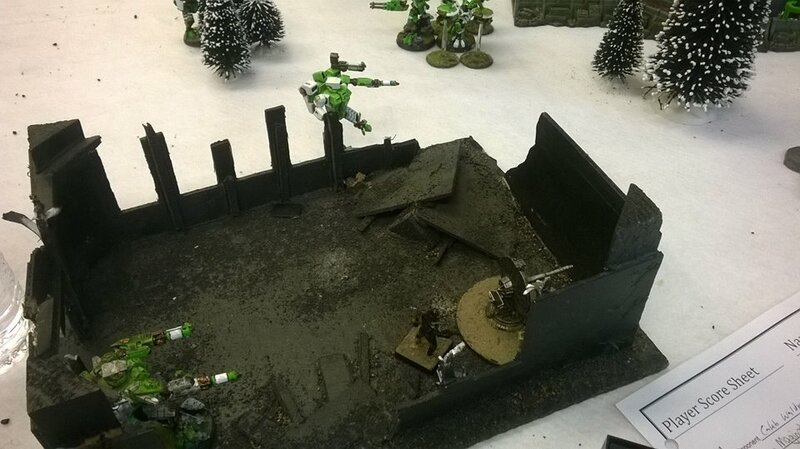 The Cloudbursts tried killing the wounded Thunderfire cannon but couldn't land enough wounds to force a failed save. In close combat my Shas'O took no wounds but missed with his Onager gauntlet again. 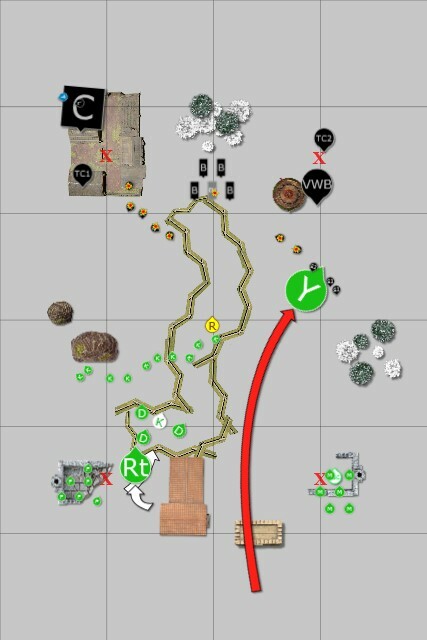 My Cloudbursts used their thrust move to get within 3" of the enemy objective and control it. Thunderhammers, Power Fists, Lightning Claws? Puh-leeez. The Scouts moved to engage my Remoras, and the Librarian moved onto the objective. He cast Psychic Shriek on my Sunforge, killing it just barely. OneThunderfire Cannon targeted the Sunforge carrying the relic. It caused several wounds and killed him. 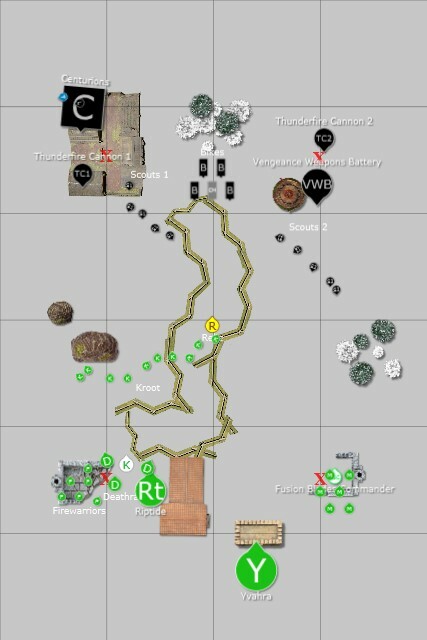 The Other Thunderfire Cannon shot at my Cloudbursts, killing a few drones and forcing a morale check. The unit failed the check and fell back. The scouts charged my Remoras, losing their Sergeant to an Overwatch shot from my nearby Sunforge. They destroyed one Remora and damaged the other. The bikers and chaptermaster failed to kill my Shas'O, but succeeded in wounding him one more time. I missed again with the Onager Gauntlet, but passed my Hit-And-Run check. I left combat, putting the Kroot between him and I. We were almost out of time, so we had to make our turns quick. We split the remaining time evenly between us. 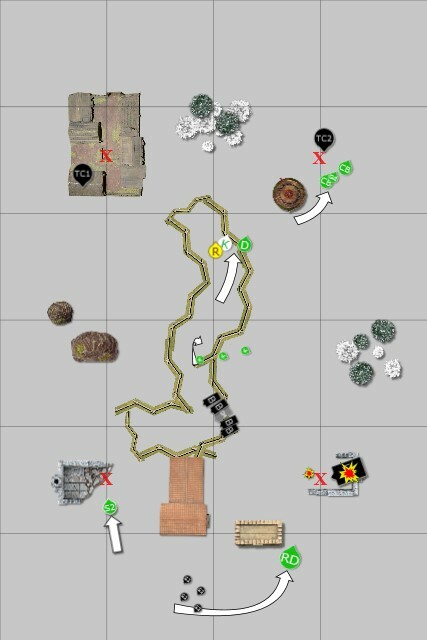 My Cloudbursts thankfully rallied and moved back towards the objective. I moved the Remora towards the Librarian and the Speeder. My Sunforge jumped toward my home objective. My Shas'O jumped to pick up the dropped Relic, but kept his Deathrain companion within range of the last Land Speeder Storm. The Kroot tried to screen the bikers, but with only 3 members it wasn't much help. The Sunforge wounded two scouts, but they made both of their 6+ cover saves! My Deathrain, with help from the Shas'O, was able to kill off the Land Speeder Storm. The Remora landed quite a few hits and finished off the Librarian. 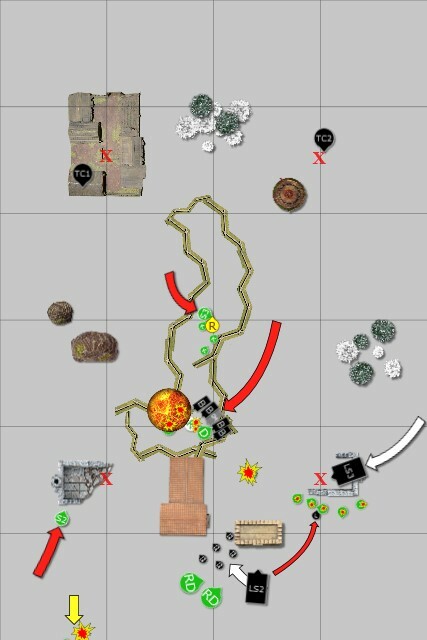 My Cloudbursts failed, yet again to kill the Thunderfire Cannon. I used thrust moves to put a tad more distance between him and I. I could have put more distance, but I was still under the impression that the Techmarines were an assault threat so I was trying to keep my distance from them as well. His bikes moved around my Kroot, the Scouts moved toward my lone Sunforge. His scouts tried to shoot my Sunforge off the objective but I only failed one wound. The bikers tried to kill off my Shas'O but couldn't get through his defenses. One Thunderfire Cannons also tried to kill my Shas'O but couldn't crack his 2+ armour. The other fired at my Cloudbursts, wounding a battlesuit but unable to get them off the objective. The bikers attempted to charge my Shas'O but lost the nearest biker (not the Chapter Master) to Overwatch fire and failed the charge as well. Time was called before he could attempt to charge my Sunforge with the Scouts. The game felt a tad cheap since he'd run out of time, but we had been fair and divvied up the last 20 minutes evenly (10 minutes each). Those Thunderfire Cannons just take forever to fire! He had done a good job of scoring points throughout the game, but I had also done a decent job of keeping those scores to a minimum. Even with my bone-headed mistakes, I'd put enough pressure on him to slow down his scoring. At the end of the game I held my home objective, one of my opponent's objectives, and the Relic. A very close game, that nearly got away from me there when I had a couple turns of complete stupidity. Had I kept my distance and forced Him to charge Me most of the time, I could have denied him more points and had more units for him to deal with. 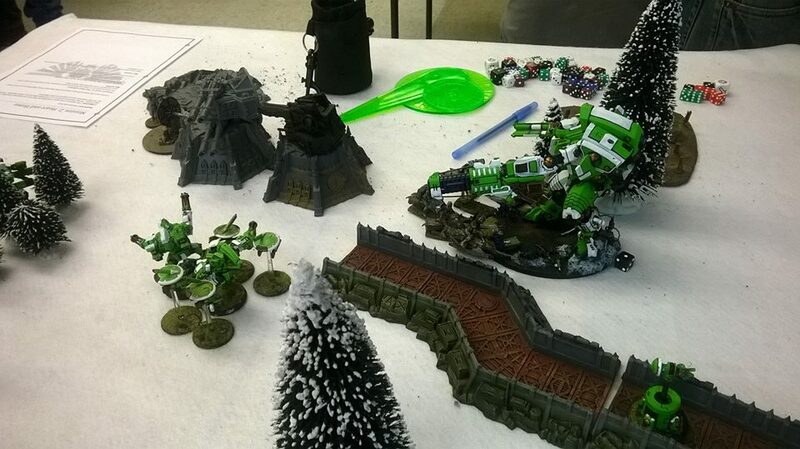 Instead I obligingly gave him my Riptide and a few of my precious battlesuits as close combat gifts during MY turn. Luckily, since he failed to cast Invisibility twice, I wasn't completely blown out of the water. He also made some errors in target priority, allowing my Riptide to survive for the counter-attack. Monats. Though I foolishly threw 3 of them away, the other 3 all did their duty well. Especially the one that seemed to have a knack for shooting Scouts in Overwatch! Support'O. He again proved an excellent tarpit, and his 50/50 chance of leaving combat was pretty handy this game. The Onager Gauntlet never connected, but it wouldn't have been inflicting instant death anyways. I love him. Remoras. They didn't rack up a huge kill score, but they were decent at cleaning up stragglers in my deployment zone. The Cloudbursts were supposed to be used in a similar capacity, but unfortunately had to be elsewhere. Cloudbursts. They arrived so late that I couldn't use them against the scouts or speeders, which would have been their target of choice. 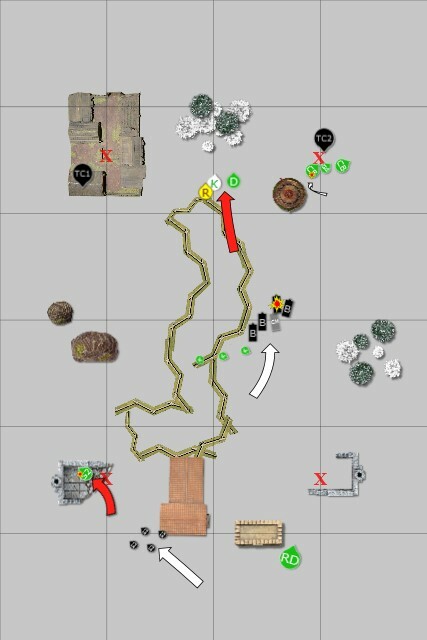 Instead, they caused no damage to a Thunderfire Cannon, and nearly cost me the game when they fled the objective for a turn. Kroot. They killed almost nothing and died to the Thunderfire Cannons early. 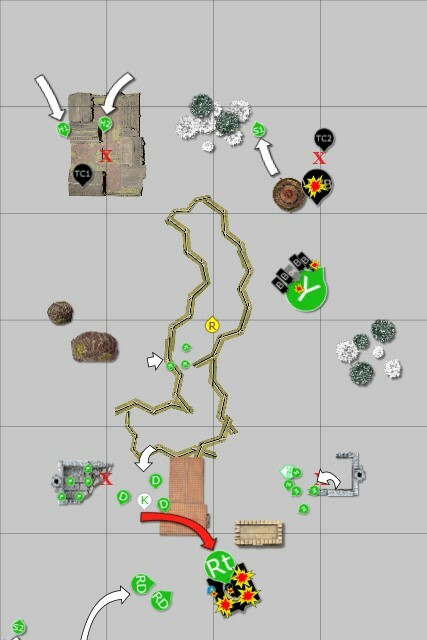 Even though they survive the whole game, the survivors were unable to contribute in any meaningful way. Fusion Blade Commander. Aside from making my opponent second-guess casting offensive powers before he died, he granted me only BS5 for the marker drones until he got caught in the open. He was forced to take exactly 4 saves the entire game and failed them all (3+). He never got into combat either. Riptide. He was handy against the Centurionstar, and I am sure he would have been handier still if I'd kept him away from the psykers. Sadly, my own stupidity bought him an early death and a lack-lustre game. Y'vahra. I got to use the turn 1 assault, which was fun, and he held up the bikers for longer than I expected him to. Even though he died on my opponent's turn, he performed well and acted as an admirable road block until I'd dealt with the Centurions. He didn't kill much though, only wiping out the one scout squad. Even if you are willing to get into close combat, know when to make Him come to You. For instance, I did not even know that Artillery units could not charge if they had any guns left! I could have left my suits on each objective until he killed them with shooting! Instead, I ran them in and got them killed by power fists. How dumb can you be? Even if they COULD charge I should have forced him to come to me instead of serving my suits to him on a silver platter...This cost me many points as I likely could have controlled an extra point at game's end and denied him a few points over the course of the game. My opponent made many mistakes, especially with splitting his fire between targets and failing to kill either. This could just be a difference in Space Marine battle philosophy, since Tau focus fire whenever possible. He also did not challenge my Shas'O which would have left my Deathrain wide open to the rest of his unit and ultimately cost him 2 points since it was my Deathrain that killed the speeder I'd Marked for Death. Thunderfire Cannons are tough and annoying. The chapter master on bike was annoying as well. My opponent learned that perhaps Tau aren't quite the pushover in close combat that he expected them to be. 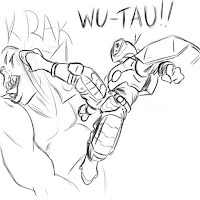 Had I been savvier, I bet he would have been downright afraid of combat with my Tau! It makes me excited for a rematch!